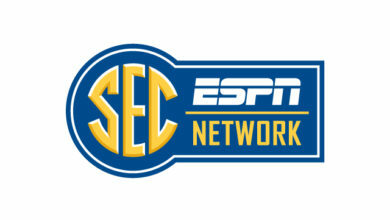 SEC Nation’s Rutledge, Spears Sign Multiyear Contract Extensions - ESPN Press Room U.S.
ESPN has reached multiyear contract extensions with SEC Nation host Laura Rutledge and Thinking Out Loud’s Marcus Spears to continue in their multifaceted roles with ESPN and SEC Network. The duo, who share the SEC Nation desk on Saturday mornings, will continue to contribute across a number of high-profile network shows and programming. Rutledge, who expanded her portfolio at the network to include occasional stints as a SportsCenter anchor and a red carpet host at the Home Depot College Football Awards and the ESPYs, finished her first year as SEC Nation host last fall and her second year with the show overall. She also contributes to ESPN and SEC Network’s live-event programming for college football, basketball, gymnastics, baseball and softball. She was a mainstay in ESPN’s extensive championship coverage surrounding the College Football Playoff, NCAA Women’s Gymnastics Championships, and both the Women’s College World Series and College World Series. Spears is a regular on College Football Live and makes several appearances throughout the week on SportsCenter and SEC Now. He contributed to SEC Network’s coverage of National Signing Day and was a field analyst for several SEC spring football games in 2018. Amanda is the Communications Manager for ESPN’s College Networks and oversees publicity for college baseball, gymnastics and track & field across all ESPN networks. Amanda is a proud alum of Hendrix College in Conway, Ark., and earned her master's in ethics from Vanderbilt University. A native of Kent, Ohio, she is a die-hard Cleveland Indians fan.